Unlike many people in my line of work, I didn’t grow up wanting to write for children. Don’t get me wrong – I love my job and I love my readers – but I started writing picture books only after years of doing other kinds of writing. I mention this partly because there are times when I feel like the woman in the song – who wanted to go to Birmingham but they’ve taken her on to Crewe – and partly because some of the things I learned on the long and winding path to where I am now have proved very useful to me and might be a help to others. The theatre (especially the musical theatre) was my first love and I often think of picture books as little toy theatres. Open one up, and it’s like the performance is about to start. There’s a sense of anticipation: you’ll have to concentrate, but you know you’re going to have fun – and anything can happen. 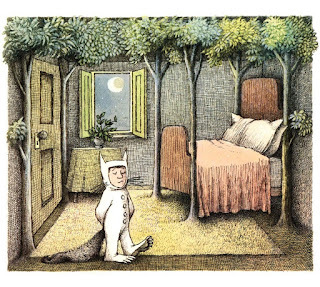 Remember Max in his bedroom as the forest grows in Where The Wild Things Are (my favourite picture book of all time)? It always looks to me like something that’s happening on a stage. 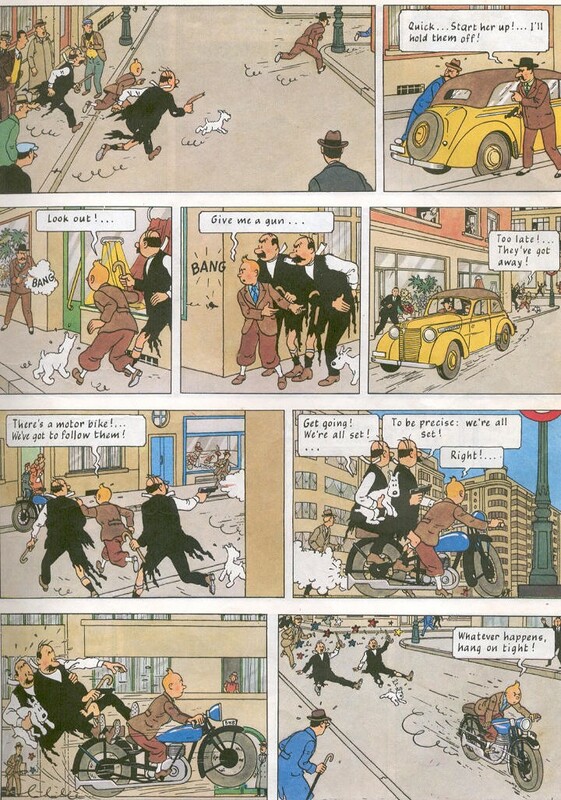 Tintin – another great love of my childhood that has endured to this day – is different. A bit more sophisticated perhaps, for slightly older readers and certainly faster. Think of the mixture of angles, points of view – the wide shots and close-ups – on a page of a Tintin book, the fast cutting, the snappy dialogue: that’s not theatre, it’s cinema. Though in some ways, it’s true, writing a picture book can be like writing a movie. As with a movie, the writer is the first person on a project. He or she has often had the original idea and works up the script alone, or with the help of an editor, but it’s the people who join the project later – the illustrator especially – whose work is most immediately apparent to the public. They are the movie stars, they are the ones who attract the audience, who give the story its face. Julia Donaldson apart, most people would be hard pressed to name a picture book writer; it’s the illustrator’s style that most often makes them take a book down from the shelf. Who wrote Casablanca? I know, because I’m a writer. It was Julius and Philip Epstein, with Howard Koch. All dead now and none of them exactly household names even when they were alive because people remember Bogart and Bergman instead and that’s as it should be. It means they were enraptured by the story; it means the writers did their job well. Because in all forms of drama – and I’m including picture books in that category – story is king. Of course you should have an eye-catching premise, interesting locations and vividly-drawn and entertaining characters. But if they aren’t all serving a story that grips your audience from the beginning to the end, you will be punished in the theatre with coughing, programme rustling and that strange squeaky noise you get when restless bottoms shift in tip-up seats. Picture book stories are shorter than most plays – the works of Samuel Beckett excepted – but children are even harder to please than theatre audiences, and not wont to mince their words when they’re bored. So take note: the secret of a good story is telling your audience the right things in the right order at the right speed. Tell them too much or too little and they’re lost. Tell them things before or after they need to know them, and they’re confused. Tell them too slowly, and they’re bored; too quickly and they’re dazed. How do you know if you’ve told your story successfully? I hope you get better with practice, but – again, as in the theatre – your last collaborator is the audience. We have previews so we can try a show out in front of an audience, and if there are things the audience doesn’t like or can’t understand, we change them. 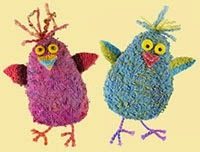 So try your story out – with children of the right age, ideally – and listen to the advice and feedback from your editor. It’s their job to let you know if the story you’re telling is coming across or not. But how do you come up with a good story in the first place? I get my ideas in all kinds of ways. 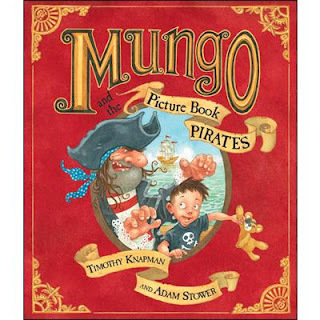 My first book, Mungo and the Picture Book Pirates (illustrated, like its successors, by Adam Stower), was inspired by my reading a bedtime story for some kids, and them asking me to read it “Again!” each time I finished. After five or six readings, I found myself wondering how much more tired than me the characters in the story must be. After all, I’d just been sitting in a chair, saying words; they’d been living the story – battling pirates and fighting sharks and all sorts. So what would happen if a boy read his favourite book so many times that its hero became exhausted and went on holiday for a bit? 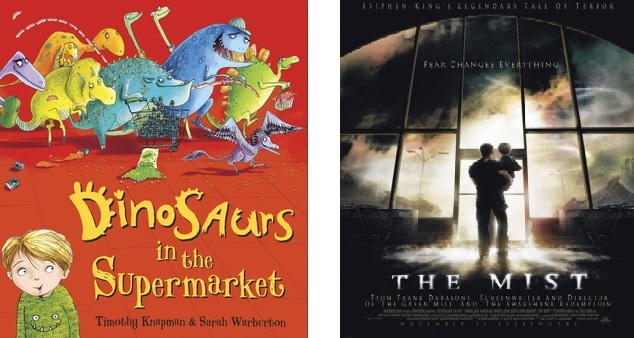 If that seems odd, I got the idea for my book Dinosaurs in the Supermarket when I was watching a gory Stephen King horror movie called The Mist. That’s about a bunch of monsters that come out of a mysterious mist to devour some small town Americans in a supermarket. It’s not, perhaps, a situation that many people would associate with entertainment for small children but I loved the way it mixed the extraordinary with the everyday – and that is a staple of picture books. So my monsters visit the supermarket too, but with mischief, not massacres, on their minds. There’s another way in which picture books are like the theatre: they’re written to be read aloud, to be performed. That doesn’t mean you should go overboard with oratorical flourishes and Shakespearean fireworks. Most mums and dads reading your books to their kids won’t be buddng Oliviers. But, providing it’s doesn’t get in the way of the clear telling of the story, a rich verbal texture can be great fun so treat yourself to the occasional tongue-twister sentence, or poetic image. And there are other theatrical tricks you can borrow which will enliven your tale. The premise of Dinosaurs in the Supermarket is that a boy is the only person who can see a mischievous gang of dinosaurs that’s making a mess in a supermarket. Every time the grown-ups turn round to look, the dinosaurs hide. But Sarah Warburton, the brilliant illustrator, leaves lots of little clues in the pictures so that the children reading the book can see what the grown-ups in the story cannot. The result? The readers end up pointing to these clues and crying out “It’s behind you!” They’re reading a book, but they might as well be at the panto. How many Stephen King inspired dinosaurs can you spot? 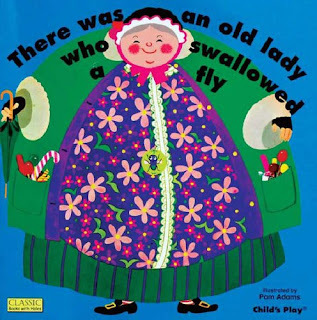 But that – as they used to say on Jackanory – is a story for another time. 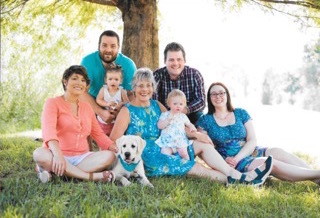 This month Carnegie Medal winning author Susan Price shares the knowledge she gained from turning her picture book manuscript into a POD book using Createspace. 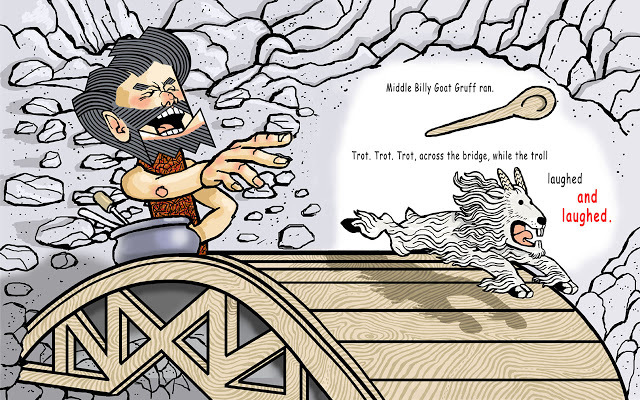 After hours of work with much cursing and teeth-gnashing my latest picture book The Three Billy Goats Gruff is at last available on Amazon, both as a paperback and ebook. The following is what illustrator Andrew and I have learned about the process. I’ll start with the paperback, published through Amazon’s Createspace. If you can make it there, you can make it anywhere. After going to the mat with Createspace, producing the Kindle will be a piece of cake. But don’t let me put you off. Lash out a couple of quid on 'How To Format Your Picturebook For Kindle Without The Frustration,' by A. Olsen and get stuck in. We found Olsen’s book invaluable, but worked out a few wrinkles ourselves too. You will need to use a graphics programme, such as Photoshop or the free Open Source programme, Gimp. There are others, such as Canva and PicMonkey, which struck me as a more user-friendly PhotoShop. If you don’t know how to use any graphics programme and can’t face learning, then bribe, trap, marry or otherwise acquire someone who can. I'm lucky in my brothers, Andrew and Adam, both of whom can use more than one graphics programme. Andrew has even taught me some of the basics. There are things to consider before you even start formatting your Createspace paperback. 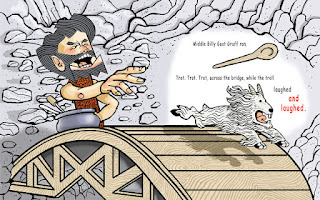 For one, Createspace won’t upload any book that’s less than 26 pages, so forget the traditional picturebook format of 24 pages, excluding front and back matter. This gives more freedom in telling the story but if you’re formatting an out-of-print (OOP) book you may need to add dedications, title pages and end pieces to reach the page-number. Cost is another consideration. Amazon charges only pennies for electronic delivery of Kindle ebooks, so a Kindle can be any length you like. Cost of production is irrelevant. But Createspace produces an actual book, which you can drop on the floor with a thump. This means costs for materials, storage and delivery. Createspace sets a minimal price: their cost of production plus their profit. Your price must be higher than this, allowing for your profit. The more pages, the higher the price. One of the great appeals of a picture book for an illustrator is the creation of a beautiful, story-telling double-page spread. But Createspace was designed to produce books for adults, with separate pages of text to the left and right, and a gutter down the middle. The automated process doesn’t lend itself readily to edge-to-edge, double-page images. Createspace’s digital previewer marks such pages as a mistake. The challenge is to publish such a book despite Createspace. You need to decide on your book’s size. Createspace offers you several. Some are almost square, most rectangular. You can customise the size by entering your own numbers into Createspace but these custom sizes aren’t made available to bookshops as the standard ones are. They can be sold only through Amazon and your own website. For Three Billy Goats Gruff, Andrew and I chose the largest standard size Amazon offers: 11 inches high x 8 inches wide (27.9 cm x 20.3 cm). Amazon always works in inches. How Do You Get The Book Into The Computer? You’ve decided on your layout and page number. You’ve decided the size of your book. But how do you get it into your computer and Createspace? First, in your graphics programme you will make a blank canvas or background. Your book’s pages will be inserted onto this canvas. When edited to your satisfaction, you’ll save them as picture files. We used the jpeg format. You’re creating a paperback, which will be printed on real paper and chopped to size. You need to allow an area around your image for 'bleed.' Anything which falls within the bleed may be cropped during the book’s production. Createspace suggest that you add 0.125 inches to the width, and 0.25 inches to the height. So, if each of your single pages is 11 x 8 inches, then this has to become 11.25 x 8.125 inches. Olsen suggests playing safe and making the bleed a half-inch. So: 11.50 x 9. Createspace provides a formula for calculating spine width. So in short, for a colour interior, you multiply page number by 0.002347 inches. 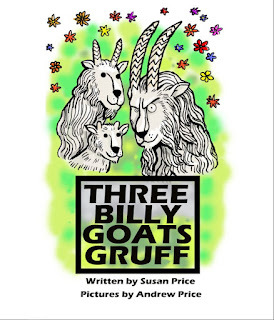 Three Billy Goats Gruff had 48 pages, so its spine width was 0.112656. Or, rounded up, 0.113 inches. When calculating page dimensions, this is halved, as one half is on one side of the gutter and the other half on the other. For double page-spreads, if your book is to be 11 x 8, you need to create a blank canvas of 11.5 inches high by 17.12 inches. You will need to mark the bleed and gutter areas with guidelines. Your graphics programme should allow you to do this. So you’ve done all your hard sums and now you can set up your blank canvas? Wrong. Now you have to supersize. Don’t make your page the size of your book, not even with added bleeds and gutter. Set a resolution too. Andrew says, make it at least 300 dpi (dots per inch: also known as ppi, pixels per inch.) He never works at less than 300 dpi. Why such huge files? Two reasons, Andrew says: to enable you to create original artwork, and to keep your images sharp when reproduced. On your supersized blank canvas, put guide lines, to show where your page edges will be. The bleed of 0.25 at top and bottom becomes a supersized inch, so the horizontal guides lines are set an inch from the top and 42 inches from the top. The vertical guide lines are set at an inch from the left-hand edge, at 33 inches from the left. You can place guides to mark the gutter too. So, you have your huge blank canvas set up, and your guide-lines in place. Now you’re going to bring your pages into the computer and place them on this canvas. You have an OOP book you want to republish. You either own the rights in both text and artwork, or own one and have the permission of the rights-holder in the other. If your scanner has a large bed, capable of producing high-quality scans, then scan your book, page by page, and save the scans to your computer as picture files. We saved as jpegs but you may prefer another format. The pages must lie flat on the scanner’s bed, to prevent outside light spoiling the image. You may have to tear your book apart to achieve this. Create a folder for these jpegs, so you can find them easily. Label each file alphabetically, ie: ‘aGoats01 – bGoats02… Back up that folder! You may prefer to take your book to a high-street printer. They will supply you with high quality scans on a CD or USB stick. Once the scans are in your computer, you can open and edit them in your graphics programme. Copy them, one by one, onto your supersized 'canvas.' Resize them. Use Save As to save them as humungeous jpegs. Make another blank canvas, this time the size your book will be. Copy your humungous jpegs onto the book-sized canvas and shrink them to fit. The image will stay sharp. Put the book-sized ones in their own folder. Name them alphabetically. What if you want to create an original picture-book? You can make your sketches or paintings on paper and scan them into your computer, saving them as jpegs. 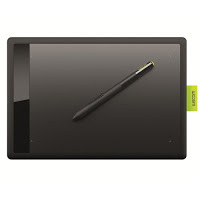 Or you can use a graphic tablet, such as a Wacom bamboo, to draw directly into your graphics programme. Or combine the two methods: scan in drawings then use your graphic tablet to rework them. Take full advantage of your graphics programme’s layers. Put every element of your work on a different layer. Think of 'layers' as a series of transparencies piled on top of one another, just as pre-digital animation used layers of transparent cells. The background was painted on the bottom layer. An important feature, such as a large tree, would be on the next layer. Characters on layers above that. The layers underneath could be seen through those on top, and formed a complete picture for the onlooker. However, details on the upper layers could be changed, without altering underlying layers. The layers in graphics programmes work in the same way. Different programmes may call the layers by different names, but I think most have something similar. Put your background drawing, in black and white outline, on one layer. Add colour to it on another layer. Name each layer clearly, so you know what is on each one. Put the outline drawings of characters on a separate, clearly named layer. Add their colour on another layer. The text will have its own layer. Indeed, every sentence can have a layer to itself. The multiplying layers can become difficult to manage. So, why bother? Well, say you want to change a tree but Goldilocks is standing in front of it. You don’t want to change her. Switch off her layer. She vanishes and you can change the tree as much as you like. When you’re happy, switch on Goldilock’s layer and there she is, in front of the tree, untouched. You can experiment with text, trying different fonts, colours, positions, sizes without changing anything except the text. You can use a background or character several times, by copying it from one 'canvas' to another. People used to brushes and pencils often find graphics programmes cumbersome at first but being able to change and refine quickly without redoing whole pages is wonderful. When you’re happy with a page, save it first in your graphics programme, with all its separate layers. Again, label files alphabetically. Put them in a Graphics Folder of their own. Back them up to an external-drive or a usb. You will be grateful you did this later. Open each image again and ‘flatten’ its layers. This amalgamates all the layers into one image. You have to do this before they can be saved as picture files and uploaded to Createspace, but once flattened, you can no longer make changes to them. But you will almost certainly have to make adjustments before you publish. This is why it’s important to first save your images as graphic files. When you need to make changes, you return to these graphics files, open them in your graphics programmes and edit them. Use the Save As tool to save the 'flattened' images as jpegs or another format acceptable to Createspace. Put them in their own folder, named alphabetically. These jpegs are huge! They are four times bigger than you need them to be. You need to resize them to the actual dimensions of your book. The way you do this will depend on the graphics programme you use. Save your new, book-sized graphics file as a jpeg. Put it into its own clearly labelled folder. But keep your supersized files. They are your master-copies. Next, loading them up to Createspace and making a book. We used Microsoft Word — eventually. If you have Word, or a programme such as Open Office where you can save a document as Word, I suggest you do the same. When Andrew and I researched making a picture-book, every source we found advised making a PDF, using Adobe Pro, an expensive programme which will create a PDF file as well as read one. We signed up for the 30 day free trial, agreeing that, if it worked, we would each sell a kidney and buy it. Readers, it did not work. We followed instructions to the letter. We hopefully loaded our PDF to Createspace’s previewer countless times — and saw tiny thumbnails crammed into one corner. We re-read the best advice by the best people, checked and re-checked our work, changed dimensions, sacrificed to Odin… Nothing worked. First, create a Word file at the actual size of your book, plus bleeds and gutter. I refer you to Olsen’s book, where she tells you exactly what to do. We learned that it’s best to add more blank pages than you’ll need to the Word file before you 'insert' pictures, as it’s much easier to 'insert' a picture file into an empty Word page than to 'add a page' after you’ve inserted a picture. When your blank Word file is ready, go through and insert all your book sized jpegs. Here is where the alphabetical labelling pays off. Instead of hunting through rows of thumbnails in the folder, searching for the one you want, they are all in neat alphabetical order. Click on the one you want, click insert, and it will appear in your Word file. Click on 'Picture Tools' on your tool bar, go to 'position' and click the central icon, the one that will centre your image exactly on the page. You may need to drag at the picture’s corner to fit it precisely. Your double spreads will have to be cropped into single pages. Word will only accept single pages. They won’t necessarily look as if they join up, but if you have your measurements correct, they will. The first time we loaded a Word file up to Createspace was thrilling because it worked! It wasn’t perfect but it was at the correct size. The pictures filled the digital book from edge to edge. The pages were out of order, and we had to add an extra title page to bump the pages along so that the double-spreads were next to each other. Look through the whole book in Createspace’s digital previewer. You may spot typos or other changes you want to make. If so, return to your original supersized graphics files, make the changes, save as a Huge Jpeg, resize to a book-sized jpeg and put it into your Word file in the correct place. When you’re ready to publish a proof-copy, Createspace’s proofer will put big red warning signs all over your work. There are live elements in the bleed areas! If the book looks as you want it to, ignore these warnings and click on the button that allows you to go ahead despite them. We advise coughing up for a paper proof, because the on-line previewer, though very good, is not perfect. When our paper proof arrived in the post, we saw lines of text much closer to the edge of the page than they had seemed on-line and Andrew spotted places in the pictures which he wanted to improve. We still had all our master-files, so were able to edit. We also turned Three Billy Goats Gruff into a Kindle ebook, which is somewhat easier and which seems to selling in America. This first attempt was a lot of hard work, but we’ve learned a lot and are confident that our second picture book, The Bremen Town Musicians, will be produced much more quickly and with less grief. I hope that's helped and good luck. You’ll know from reading other blog posts on the Den that texts rarely pop into your head fully formed. It’s only happened to me once - in December 2008 and that instant moment has taken until now to see it in print. It was when I took my son Andy to visit his brother, then working as an adventure tour guide in Venezuela. 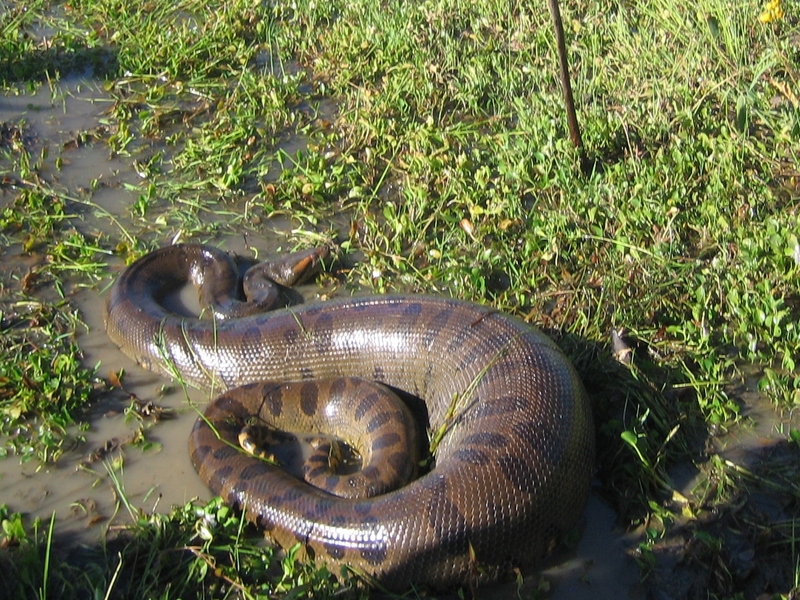 Rob and his business partner Luis took us to Los Llanos to look for anaconda - and we found one! It was very sluggish and sleepy because it was digesting a huge meal. We had to be careful not to disturb it because that might make it regurgitate… PING!!! A rhyme popped into my head plus title - I Saw Anaconda! The anaconda and the wonderful Venezuelan wildlife we saw on the trip. The rhyme ‘There Was an Old Lady Who Swallowed a Fly’ - specifically the version illustrated by Pam Adams which I’d read aloud many times. An adventurous boy who hadn't changed that in that respect much since he was little. Being bitten by lots of bugs when I passed out in the grass after the skydive, and having to check myself for ticks after (Xmas present from Rob that year, sheer terror, thanks, Rob). When I got back, I sent off the rhyme to my agent, who loved it - and who sent it on to publishers. Over the next five years it got rejected - A LOT. Everyone who saw the text liked it, but the feedback was there were too many words on the final pages, it would be too hard to illustrate, Venezuelan wildlife (especially tick, skink and caiman) wasn’t easily recognisable or cute enough. Then, long after I’d resigned myself to it never becoming a book, Nosy Crow took the text, tick, skink and all. It published on 1 September 2016. 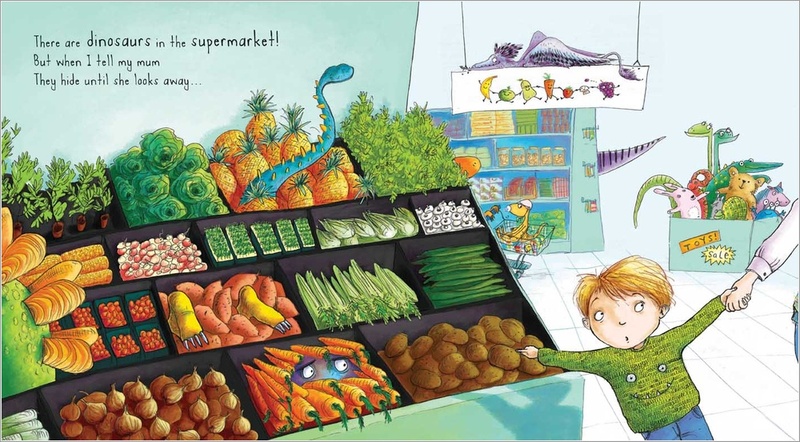 I’m absolutely in awe of the clever way Nosy Crow have presented it with pull out snake and flaps - and Emma Dodd’s fab illustrations. It's been a while since that trip. Rob and Amy (they met in Venezuela) married and they have a 2 year old daughter and another on the way, and Andy’s married to Helen and they have a daughter, too. I’ve become a grandma and ditched the hair dye, and it's highly unlikely that I will go anaconda hunting (or skydiving) again, though hopefully lots of new adventures await. So thank you, thank you, thank you, The Catchpole Agency for sticking with it and for the Nosy Crow team and Emma Dodd for bringing it to life, I’ll treasure ‘I saw Anaconda’ as a reminder of an amazing and unrepeatable experience. I wish you picture book writers out there a happy PING moment in your writing lives, too. If you’ve already had one, l’d love to hear about it in the comments! Labels: Emma Dodd, I Saw Anaconda, Jane Clarke, There was an old lady who swallowed a fly.